The book, published in March 2015, is available from Sipar Books and at the Banteay Srey bookstore. It was self-published by Phina’s small organization, an impressive feat given the time and resource constraints on young Cambodian authors. Through her writing, up-and-coming female author Phina So wants to inspire young Cambodia women. But being a writer in Cambodia is not easy, she told VOA Khmer in an interview. After graduating with a bachelor’s degree in psychology from the Royal University of Phnom Penh, Phina worked for civil society organizations on children’s rights, community development and advocacy. In 2010, she won an Australian Development Scholarship to pursue a master’s degree in social work at the Royal Melbourne Institute of Technology University. After returning home in 2013, she joined the Cambodian Development Resource Institute as a researcher. But besides working full-time, she is a voracious reader of books. And it was this love of literature that drove Phina to co-found Kampu-Mera Editions, an upstart publishing house dedicated to promoting the work of Cambodian women writers. With a friend, she began writing and collecting short stories by different women authors. They complied the anthology “Crush Collection,” comprising nine stories authored by Phina and five other women. 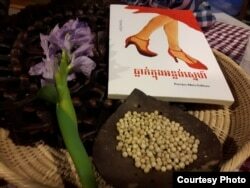 The book aims to convey valuable, positive messages to independent young women in Cambodia. She was driven to compile the stories—about issues relating to young people’s relationships—after seeing how Cambodian women use social media sites like Facebook, Phina told VOA Khmer. “Through social media, I understand the feeling of teenagers nowadays after breaking up with their lover—some of them may hurt themselves. Eventually, I came to the conclusion that I should do something for the sake of society,” Phina said, insisting that fiction can help people to see that their problems are shared by others. “Once a relationship is over, it is not the end of the world. Maybe an ending means a great new start,” she added. Most writers must support their writing with other work, said Phina, creating difficult choices over how to divide one’s time. But Phina’s motivation and commitment prevail. She wants to contribute to promoting and preserving the Khmer language, and hopes that future anthologies will get more support as writing in the language becomes more stimulating and original. Kampu-Mera Editions aims to publish at least one or two novels each year as it tries to build a level of recognition in Cambodia’s publishing industry. Phina is now working on the next anthology, on the theme “My Most Critical Day,” which is expected to be completed next year. One of Phina’s readers, Malin Lok, who works for an NGO, praised “Crush Collection” for daring to diverge from the expected happy ending in its stories.